This graphic memoir is about growing up in a family in the shadow of addiction. It's at once hopeful, humorous, gritty and very real. Perfect for teens and older middle grade readers. A National Book Award Finalist! In kindergarten, Jarrett Krosoczka's teacher asks him to draw his family, with a mommy and a daddy. But Jarrett's family is much more complicated than that. His mom is an addict, in and out of rehab, and in and out of Jarrett's life. His father is a mystery -- Jarrett doesn't know where to find him, or even what his name is. Jarrett lives with his grandparents -- two very loud, very loving, very opinionated people who had thought they were through with raising children until Jarrett came along. Jarrett goes through his childhood trying to make his non-normal life as normal as possible, finding a way to express himself through drawing even as so little is being said to him about what's going on. Only as a teenager can Jarrett begin to piece together the truth of his family, reckoning with his mother and tracking down his father. 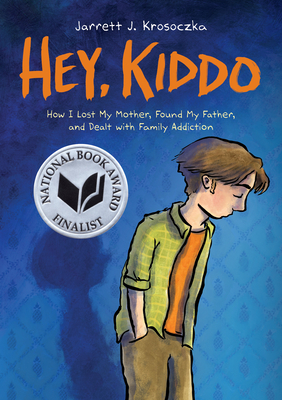 Hey, Kiddo is a profoundly important memoir about growing up in a family grappling with addiction, and finding the art that helps you survive. Jarrett J. Krosoczka is a New York Times bestselling author, a two-time winner of the Children’s Choice Book Award for the Third to Fourth Grade Book of the Year, an Eisner award nominee, and the author and/or illustrator of more than 30 books for young readers. His work includes several picture books, select volumes of Star Wars: Jedi Academy, the Lunch Lady graphic novels, and the Platypus Police Squad novel series. Jarrett has given two TED Talks, both of which have been curated to the main page of TED.com and have collectively accrued more than two million views online. He is also the host of The Book Report with JJK on SiriusXM’s Kids Place Live, a weekly segment celebrating books, authors, and reading. Jarrett lives in Western Massachusetts with his wife and children, and their pugs, Ralph and Frank.